I have long had the dream of opening a dark, smoky, Eastern European coffee shop, where the grouchy (but stealthily kindhearted) waitresses would serve handmade pastries with perfect espressos. They would bark orders, frighten tourists and hustle out the lingerers— morose poets and spies, of course there would be spies— to make room for the next trench-coat-wearing patron in need of my version of soul food. Until that day, I am left to baking my way through the list of contenders for positions in my future bakery case. The Indianerkrapfen (Indianer “Cup Cakes”), on Page 127 of Rick Rodgers’ meticulously researched dessert book, have always seemed a candidate for top-shelf position, though I had never made them. Rodgers is quite specific on the proper shape of these little ganache-topped, jam- and whipped-cream-filled sponge cakes: Nothing short of globes will do. While denizens of Vienna have easy access to the Indianerkrapfen molds required to produce cake orbs, we do not. The closest thing we have is the Danish apple dumpling pan, or ebelskiver, special equipment that I had yet to accumulate. And I wasn’t about to go for second-best (baking them in muffin tins). Then came Three Cubed, and here I am, proud owner of a cast-iron dumpling pan. Indianers definitely fall into the “little balls of happiness” category of food (like Julia Child’s wine-braised pearl onions or, in general, gougères). They taste divine, especially with sour cherry jam instead of the apricot in the original recipe. However, these are a pain make. The ebelskiver produces seven cakes at a time, after which you must let the pan cool, then rinse and dry it before you can move on to the next round. The cakes also are cooled, then cut so they have a small base and larger cap (interior removed so it is just a shell), spread with jam on the inside, filled with whipped cream and topped with bittersweet chocolate. They have little to no shelf life, especially in summer heat. 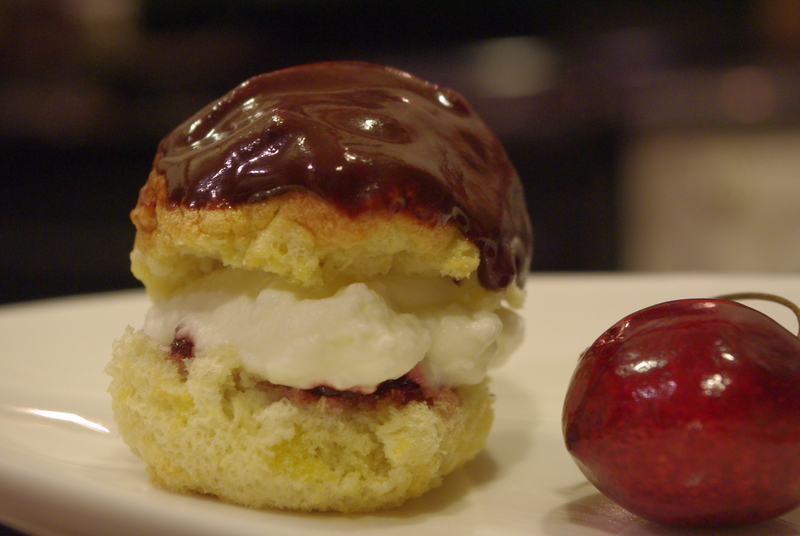 Indianers do serve up the wow factor, reminiscent of an éclair—with a nice, spongy twist. A pinch of gelatin or dollop of sour cream might help the whipped cream hold up for a little while, though I cannot imagine how they keep if fully assembled. So if you plan to make these—and I suggest you do or, better, convince someone to bake them for you —finish them á la minute. A recipe similar to that in the book can be found here, though I recommend buying Kaffeehaus and giving Rick a little love. He certainly put it into this book. I want to hang out in that coffee house. You can even help sling sacher tortes! But you’ll need to get grumpier! Did you make these again? They actually kept OK in the fridge for a few hours after serving last time. But then I ate them all. I made them again to get photos… the lengths we go.